I was glancing through the latest issue of Martha Stewart Magazine yesterday and I came across the four "What's for Dinner" recipe cards featuring the humble chicken thigh. Inexpensive, moist and tasty, chicken thighs are the unsung hero of the poultry world. They also happen to be my favorite cut of poulet. I can find the organic thighs for a third the price of chicken breasts at most any grocery, so I will often buy them. Bone-in chicken is tastier because cooking meat on the bone yields a juicier and tastier cut of poultry or meat. I'd prefer skinless but don't mind removing the skin myself to save some fat calories and a few bucks in the process. I had a package of chicken thighs, some grape tomatoes, plenty of fresh and dried thyme and olives in the refrigerator, so I knew that I had to make this dish. Like with many of the Martha Stewart recipes, I found that I needed to simplify it a tad - taking a good idea and making it work with what I had on hand as well as reducing steps and calories. The original recipe called for shallots, mint and feta - none of which I had. I wanted this to be a quick cook, one pot meal, not a big elaborate fancy dinner. I'm thinking weeknight cooking - under 40 minutes. Add or subtract what you want, the idea is what matters most. 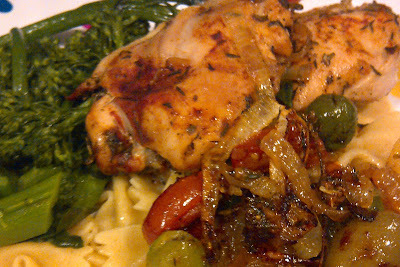 We had this over some bowtie pasta, the tomatoes and onions made a sort of "sauce" that worked well. It would also be good with roasted potatoes. Serve with a green vegetable to round out the meal. I had broccolini already made - perfect and saved some cooking steps too! 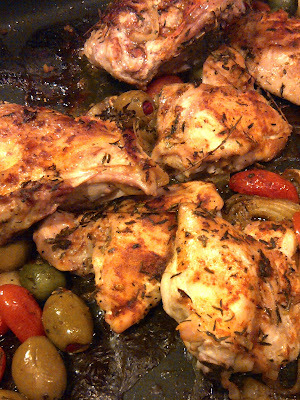 Add the chicken, sliced onions, sliced tomatoes, and olives to a roasting pan. Season with the dried and fresh thyme (if using). Drizzle with olive oil and season everything with the thyme, paprika, salt and pepper, tossing to combine. Roast until at thermometer inserted into the chicken thigh registers 165 degrees - about 30 to 35 minutes. Remove chicken from oven and allow to sit for 10 minutes to continue cooking, covered loosely with aluminum foil. Serve hot, with roasted onions, olives and tomatoes, along with any accumulated pan juices. Serve with hot cooked pasta, egg noodles or over potatoes. Serves 3 to 4 people, 2 thighs per person.